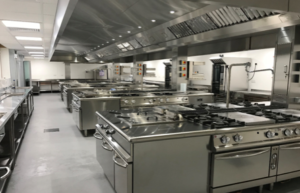 In the summer of 2017, a major refurbishment of the catering department of Yorkshire Coast College was carried out. EMCE Building Services were contracted to install a brand new M&E infrastructure to the department, along with Air Handling and Ventilation services to the three teaching kitchens. As well as the M&E upgrade, EMCE were appointed as main contractor to carry out the aesthetic refurbishment of the department.